I was not part of this project. 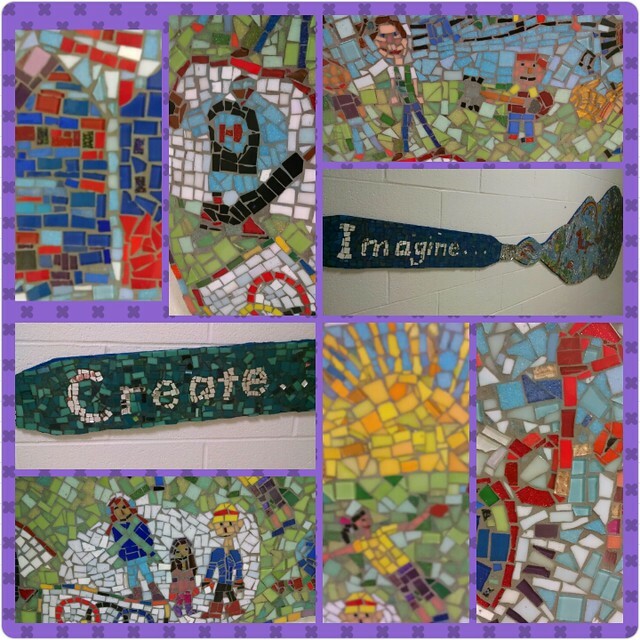 Our art teacher and a visiting artist worked with students in our school to create this amazing mosaic project on the theme of “create” and “imagine” and it hangs right outside my classroom right now. I am one lucky teacher. Every time I wander by, I see stories emerging from the tiles of this mosaic. Students in the upper grades worked during a week on this, designing the images and laying out the tiles. The closer you get, the more detailed it becomes. But even from a distance, there is creativity in bloom. This is what school is about. Where else would most of these kids have a chance to do a full mosaic art project like this? And what a gift to the school for years to come. Did I mention it is right outside my classroom? This entry was posted in my classroom, Slice of Life. Bookmark the permalink. I am swooning over this incredible project! Thank you so much for sharing it with us! Love it!!! How lucky you are to have sources of inspiration and appreciate them and share them. It is very lovely indeed. I love when kids are engrossed in projects like this, and envy you for being inspired by the students on a daily basis, right outside (and inside) your door. 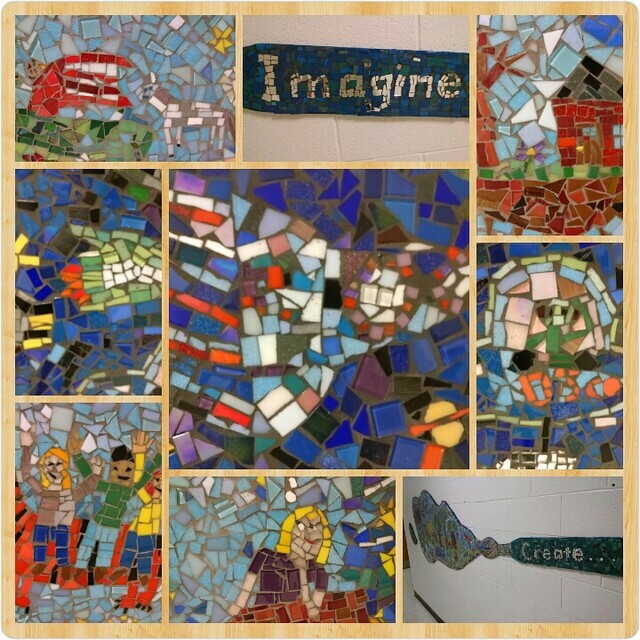 Years ago, I worked in a school that made mosaics for the entry way. I remember the process being so cool — creativity, collaboration, revision. I agree we need more of this in schools — it really integrates everything. Thanks for sharing. Kevin, I have some photos of the tile project at the Long Beach Boardwalk that I walk with my family. I centered two slices around the artwork. The one outside your classroom is beautiful, so colorful and detailed. Students could get lost inside the images if they let their mind really see beyond the pieces. It was great being in this and other challenges with you.